In the Environmental Science class at LCC, students will generate a lot of data while completing their labs and discussion boards. In one assignment in the online sections, students are required to take a 20 minute walk and make a list of all of the litter they see on their trip. It’s amazing what they find: all kinds of plastic wrappers, one shoe, and even an entire couch. In previous semesters I would provide feedback to individual students in the gradebook but never tried summarizing the overall results. It seemed like a wasted opportunity for “in the moment” sharing and learning. Representing the data in a graph seemed too formal a process for this assignment (and a little too much work), so I tried out an online tool called Wordle. Wordle is a program which takes a list of words to generate a “word cloud”, the size of the word loosely representing the number of occurrences in the complete set of text. 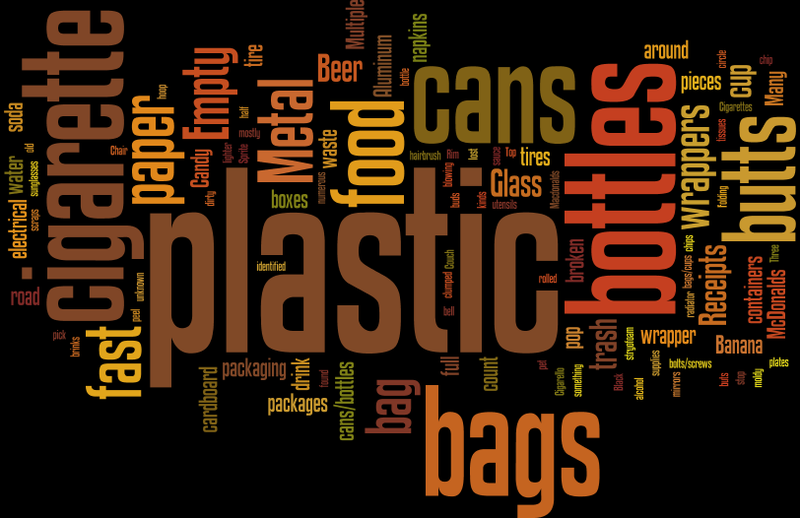 To create a Wordle for the students’ responses I copied all of their lists of litter and combined them into one big, messy Word document. I then copied the text into the textbox on the website, which also lets you select a layout and color scheme. The result is a visually interesting way to represent the top 100 words found in the students’ lists. Because of the nature of the assignment, the graphic also conveys a powerful message. To learn how to use Wordle or to share your ideas, visit us in the CTE or email Meg Elias at clarkm1@star.lcc.edu.